For a songbird, learning a new song is akin to a child learning a new language. 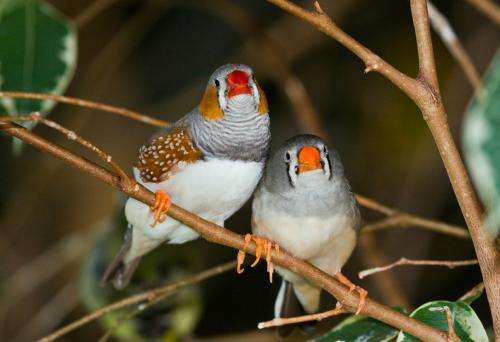 Zebra finches approach this challenge step by step, and even make a detour in the process - by taking song syllables that they already know and adapting them to the syllables that they have to learn. During this learning phase, the syllable sequence often gets mixed up. The birds then arrange the newly-learned syllables into the correct order in the next learning phase. Researchers led by Richard Hahnloser, a professor at the Institute of Neuroinformatics run by ETH Zurich and the University of Zurich, have reported these findings in the latest edition of the journal Nature Communications. "The zebra finches have evolved the strategy of dividing a task as complex as learning a new song into easy-to-manage parts," says Hahnloser. "This allows them to expand their repertoire with minimal effort." The scientists made this discovery in an experiment with young birds that were less than a month old at the start of the study. On a daily basis, the researchers broadcasted a song to the birds, which the birds then learned. After a month, the researchers changed the song and the birds tried to adapt their song to the new one. "In nature, birds instinctively adapt their songs to those of adult birds of the same species," explains Hahnloser. The researchers recorded all vocalizations made by the birds and used a computer to evaluate them syllable by syllable. The letters represent different syllables (each of a specific pitch): + and - for a positive and negative semitone change, ++ for a whole tone change. Bird that learned the song ABCB+ in the first place, with the difficult task of learning a second song AB++CB-. The bird must learn to sing syllable B both a whole tone higher and a whole tone lower. To do this, it makes a detour via the song AB-CB++. This means that it first changes the syllables each by a semitone (two small changes) and then tries to arrange the syllables into the correct order - which actually not a single bird achieved in the experiment. The birds reached adulthood during the course of the experiment; adult birds no longer change their song. "Interestingly, the birds' strategy closely resembles the best methods currently used in computer linguistics to compare documents," says Hahnloser. These algorithms compare written documents by considering their words in their context but regardless of their exact order. By comparing billions of texts, these algorithms can estimate the similarity of two words in terms of a number. In this way, for example, they identify that the words "house" and "building" have almost the same meaning. These computer programs can also search through millions of documents to identify which is most similar to a given text, by determining which document contains the vocabulary that can be most easily adapted into the vocabulary of the comparison text. "Today's computer scientists therefore use the same strategy that songbirds evolved - the birds have probably been using it for millions of years," says Hahnloser. It is still uncertain whether infants use a similar approach when they learn their first or second language. However, Hahnloser believes that there are numerous similarities between the way humans learn to speak and the way birds learn their songs. Songbird research has already shown striking parallels with speech development in young children. For example, earlier studies showed that young birds and young children practise every single syllable extensively through duplication (with children, for example, "baba" or "dodo"). These studies showed that both continue to do so when learning new syllables even after they already mastered vocalizations containing two different syllables (with children, for example, "rabbit"). Hahnloser's latest research into songbirds has led to the hypothesis that young children also use a minimalist approach when it comes to learning a foreign language; they learn new sounds (for example, the nasal vowels or rolling of the R in French) by minimally adapting the sounds they already know, at first without considering the context of these sounds in the foreign language. However, further studies are still required to ascertain whether this is in fact the case.